Black America is in a prime position to chart its own destiny and path toward a better and brighter future, but it will take focus, working together and a commitment to implementing realistic and practical strategies to move forward. During the first few days in the new administration of U.S. President Donald J. Trump, anger, fear, dissatisfaction and uncertainty has gripped millions of people inside and outside America. But, in the midst of turmoil, chaos and confusion, can Blacks use this as an opportunity to begin building a bright future? 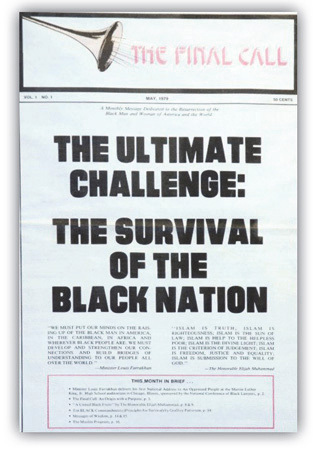 First issue of the Final Call newspaper produced by The Honorable Minister Louis Farrakhan in the basement of his home, in 1979. “We’re not going to get a bigger slice of the pie under Trump but can we maximize our own resources internally so that we can have more? We’re not going to get it because Mr. Trump gives it or because Mr. Trump does anything in particular,” she added. According to the U.S. Census Bureau the population of Blacks either alone or in combination with one or more races was 46. 3 million on July 1, 2015, an increase of 1.3 percent from the previous year. The Black population alone or in combination with one or more races is projected to jump to 74.5 million by 2060 which would make up 17.9 percent of the U.S. population. Blacks currently have $1.2 trillion in buying power, and there are 2.6 million Black-owned businesses in the U.S. All except for 109,137 or 4.2 percent, of Black or African American-owned firms were non-employers. When it comes to education, 84.7 percent of the Black population 25 and older has a high school diploma, 20.2 percent of that same age group has a bachelor’s degree or higher and 2.8 million Blacks were enrolled in undergraduate college in 2015. Yet when it comes to unemployment rates and wages, Blacks still lag behind. According to the Economic Policy Institute (EPI) Black-White wage gaps are larger today than they were in 1979. “Relative to the average hourly wages of White men with the same education, experience, metro status, and region of residence, Black men make 22.0 percent less, and Black women make 34.2 percent less,” notes the Washington, D.C.-based group. Among other statistics the institute noted is that the Black-White wealth gap is larger than the wage gap. Median White wealth is $134,000 or 12 times higher than median Black wealth at $11,000. Twentyseven percent of Black households have zero net worth compared to nine percent of White households. Housing discrimination, housing segregation and environmental racism particularly in poor and minority communities is also connected to health, future economic well-being and crime rates, noted “Racial gaps in wages, wealth, and more: a quick recap” written by Elise Gould on epi.org. In many of these areas, Blacks and Native Americans are disproportionately at the bottom. “In other words, Black Americans face particular difficulties in trying to get ahead themselves or helping their children get ahead—in achieving the elusive American dream,” notes EPI. But all is not lost. There are things we can do to be more efficient with our resources internally, explained Dr. Malveaux. “That’s where we need to look now.” Focusing on politics from the perspective that there are going to be as many as 33 U.S. Senators up for re-elections in 2018, as well as focusing on state and local elections is one strategy, she continued. But economics is the key area where Blacks have tended to pay less attention than politics, Dr. Malveaux pointed out. “We need to pay more attention to economics, especially in this time period.” Individually, Blacks must begin to pay attention to and manage their individual finances, she continued. Dr. Malveaux and other analysts and activists also point to the various #BuyBlack and #BankBlack initiatives as a critical measure for Blacks to begin taking control of their future. Michael A. 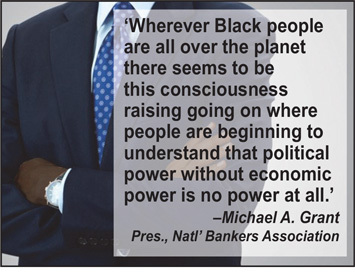 Grant is president of the National Bankers Association which was originally founded as a trade association for the country’s Black-owned banks and today advocates for Black and other minority-owned banks. The more Black banks are supported by the Black community, the more Black banks can give back to the community through business and home loans and other financial endeavors, he explained. Mr. Grant told The Final Call that there is a consciousness rising not just among Blacks in America but throughout the Diaspora when it comes to supporting Black-owned banks through deposits and doing business. Black banks in Africa and the Caribbean have reached out to the National Bankers Association about future endeavors. “This movement toward Black economic empowerment is not limited to the sovereign boundaries of the U.S., it’s literally a world-wide thing. Wherever Black people are all over the planet there seems to be this consciousness raising going on where people are beginning to understand that political power without economic power is no power at all because at the end of the day money drives everything,” said Mr. Grant. Since July of last year, Mr. Grant said there has been a phenomenal outpouring of support for Black-owned banks in the U.S. and he thanked celebrities such as T. I., Killer Mike, Solange and others for standing up as advocates and encouraging others to open deposits. One bank has reported that since the #BankBlack movement started last summer it has had $30 million in new deposits and $120 million in lending. “Those two are connected. The reason you want people to open deposits is liquidity and then if the bank has the responsibility to go out and raise capital it is the liquidity plus the capital that increases the bank’s capacity for lending. The more lending the bank can do, especially to our small businesses the more jobs and opportunities they can create in our communities,” said Mr. Grant. He as well as other heads of national Black organizations have received numerous invitations to present on Black economic empowerment and supporting Black-owned businesses. The Honorable Minister Louis Farrakhan is directing Black America in particular to what his teacher, the Most Honorable Elijah Muhammad, warned and that is that God will make Blacks separate, explained attorney and author Dr. Ava Muhammad during a recent broadcast of her blog talk radio show, Elevated Places. “We’re witnessing and experiencing America disintegrate into her constituent parts, that is what’s literally occurring and for Saviours’ Day the Honorable Minister Louis Farrakhan, his address is, ‘Have No Fear For The Future: The Future is Ours,’” said Dr. Ava Muhammad during the show’s Jan. 26 broadcast. Dr. Ava Muhammad is also a student minister in the Nation of Islam and student national spokesperson for Min. Farrakhan. 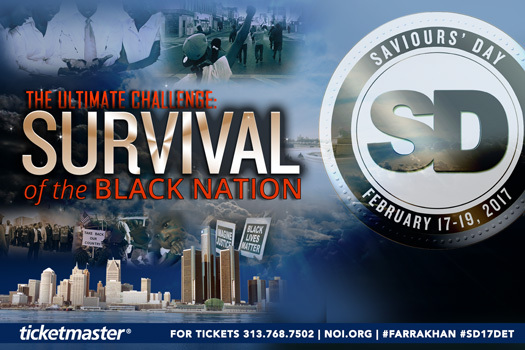 Saviours’ Day is the Nation of Islam’s annual convention and will be held this year in Detroit the weekend of Feb. 17-19 and will consist of plenary sessions, interactive workshops centering on Nine Ministries (Education, Information, Health and Human Services, Defense, Justice, Arts and Culture, Science and Technology, Agriculture and Trade and Commerce) conceived by and developed by Min. Farrakhan as a catalyst for nation building in the Black community. The theme for Saviours’ Day 2017 is relevant, very appropriate and timely, especially in the areas of health, education and economics, said Student Minister Ishmael R. Muhammad, National Assistant to Min. Farrakhan. “All of the current statistics tell us that if we don’t act and respond quickly to these indicators that as the Black male is becoming increasingly endangered, the next step for us is extinction if we do not act responsibly to these vital signs,” said Student Minister Ishmael Muhammad. So the survival of the Black nation is important and the Black community is invited to participate this Saviours Day, he continued. For more information on Saviours’ Day 2017, visit noi.org and see the ad on the back page.